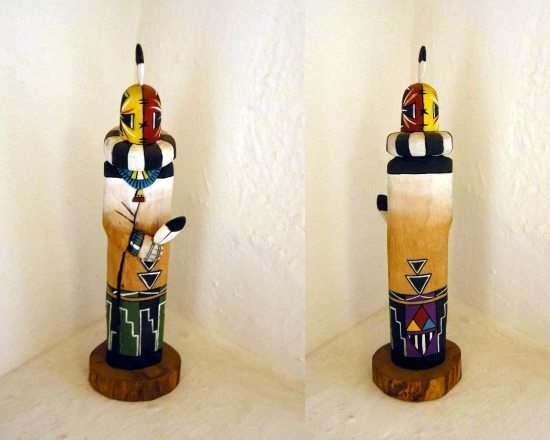 Aya (“The Runner”) is handcrafted in the traditional Hopi style, of a single piece of cottonwood root, by master carver Josh Aragon (Hopi/Laguna). Roughly 9.5″ from feather tip to base, Aya wears the classic ruff and sack mask, and carries an eagle feather instead of a yucca whip. Hand-painted in traditional patterns. All content, including photos and text, are copyright Wings and Aji, 2015; all rights reserved. Nothing herein may used or reproduced in any form without the express written permission of the owner. Posted on Saturday, June 21st, 2014 at 1:59 am. Filed under: Katsinam	RSS 2.0 feed.